It’s a new year and it’s the perfect time to add some serious distance to your shots. Get equipment to help you hit it further. Improve your body so you can swing more efficiently. 1. Train to swing faster/improve your body. 2. 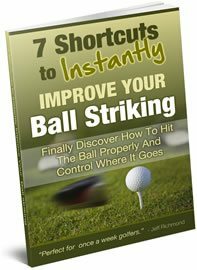 Improve golf swing mechanics. 3. Get fitted for equipment. Having ‘get fitted for equipment’ as last might be controversial, because I know there are a lot of instructors that say you should get fitted for the right equipment first. But here’s why I disagree with that. If you do the right things, you can easily add 10 mph of speed to your swing in less than 30 days. And you can do everything needed to add 10mph+ of swing speed, indoors, at home. So if you get fitted with equipment NOW and then add 10 mph swing speed to your swing 30 days later then your “fitted” equipment is no longer fitted and you’ve just wasted your money. That’s why my first recommendation is to max out your swing speed. For some golfers that will be going from 70 mph to 90 mph. For others it will be going from 100 mph to 120 mph+. However, there will come a point when you will get very little gains from swing speed training. My educated guess for swing speed training for a golfer that is not doing much at all to swing faster, is that most golfers could expect about 20mph increase in swing speed over a 6 month period with the appropriate training. So if you swing at 90 mph now, you could expect to swing about 110 mph on average. IF YOU DO THE RIGHT THINGS. That’s almost the average Tour pro level, which is 114 mph on average. And that would be a swing speed to handle any golf course. Also, 20 mph increase in swing speed equals over 40 yards longer shots on average. 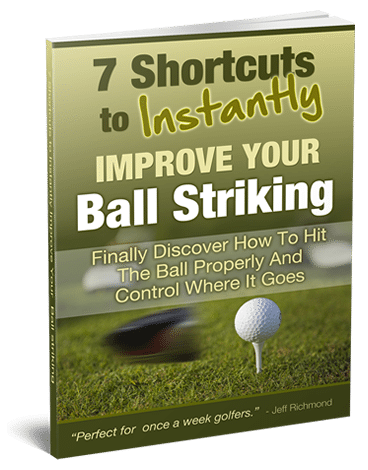 After that, then you could focus on becoming more efficient with your golf swing so it’s more easily repeatable, and you hit the ball in the middle of the clubface more and have better misses. That should be the aim of any golf instruction. It’s not to make your swing look a certain way. It’s to help your misses not be that bad. Look, your great shots will always be great shots. But golf is a game of misses. When your misses are not that bad, that’s when you’ll slash strokes from your scores. Finally, after you’ve maxed out your swing speed and your golf swing is efficient, then you should get custom fitted for golf clubs. But don’t mix up my message. I’m not saying that in the mean time you can just play with any golf clubs. But buying expensive shafts over off the shelf shafts is probably not going to help you much. Anyway, it’s because of this that in January 2015 I’m going to be focusing on helping you to train to swing faster, and to do certain things in your golf swing to help you approach impact at a faster rate. Also, what I’m telling you to do will also help your waistline. Because I imagine, like me, you’ve eaten slightly more than you should have over the holiday period and it’s now time to start shedding some pounds. So why not shed some pounds and gain some distance at the same time?! Let’s get started by going here….